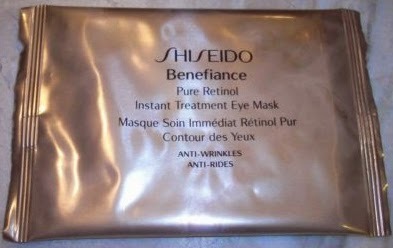 THE SKINNY: I'm one of Shiseido's biggest fans, but I was disappointed with its Benefiance Pure Retinol Instant Treatment Eye Mask. It didn't do much for me. Here's how it works: Take the two under-eye patches and press them into place. They're not sticky, but they are really wet and gooey. They're also much bigger than I needed them to be, so the fit is a little awkward. Leave them on for 15 minutes. They feel nice and cool. Then a little warm (the retinol working, I guess). Then cool again. Then peel them off and lightly massage what's left of the moisturizing goo into the skin beneath your eyes. Shiseido says this will instantly erase dark circles and puffiness and leave your eyes feeling plumped and hydrated for 24 hours. I didn't see much difference, really, but I don't look any worse. I've found better options for under-eye treatments. KEEP OR TOSS: I used my sample and will not buy again. CHECK IT OUT: Find these at high-end beauty stores such as Sephora.